Was last season’s run to the playoffs a sign of things to come… or was it a fluke? So with the Avs, the question is: Can they do it again? Like the Nuggets, the Avalanche came down to the final game of the regular season in control of their own destiny. Unlike the Nuggets, they were at home (against the Blues) and won. And it was on to the postseason, were the Avalanche fell to Nashville in six games. Fact of the matter was that not even the Avalanche front office expected the team to make the playoffs in 2017-18. The realistic goals were to shed the stench of the 48-point disaster in 2016-17, to not deviate from Joe Sakic’s plan to get faster and younger, and to at least kick up the entertainment quotient at the Pepsi Center. It was more about winning back the market and emerging from the season with bolstered hope for the future. Little steps, in other words. The Avalanche got good again. The early November trade that sent Matt Duchene to the Ottawa Senators in the three-team deal that also involved the Nashville Predators brought the Avalanche an incredible haul – first-, second- and third-round draft choices, defenseman Samuel Girard, winger Vladislav Kamenev, Boston University center Shane Bowers and journeyman goaltender Andrew Hammond. What made it even more stunning was that Sakic displayed remarkable patience, even as – and some of this is 20-20 hindsight – Duchene’s frequently pouting demeanor over nearly a full calendar year behind the scenes was a detriment to team chemistry. It went from the Avalanche considering offers for Duchene, to Duchene requesting a deal and showing up at training camp and delivering a bizarre brief statement to reporters and then walking away. That was unsettling, and it got even more strange a month into the season when Duchene was sent across the ice during a stoppage in Brooklyn and the trade was announced. It made the Avs better, though at times over the remainder of the season it seemed the teenaged Girard was being rushed and would have benefited from another year in major junior, and Kamenev suffered a broken forearm, wasn’t medically cleared to play until March and ended up suiting up for only three games for the Avalanche. The Avs’ other major young prospect, 2016 first-round pick Tyson Jost, had an up-and-down rookie season after leaving North Dakota following his freshman season, getting 12 goals in 65 games. He didn’t turn 20 until March, and nobody came away doubting his legitimacy as a long-term asset. Most important, Nathan MacKinnon took off, finally looking more like a generational NHL No. 1 overall draft pick than just some guy the Avalanche settled on when holding that top choice in 2013. It validated the Avalanche’s approach of committing to him as the top-line center, a role Duchene – who didn’t like playing wing – coveted. He had 39 goals and 97 points and was a finalist for the Hart Trophy, recognizing his impact in the turnaround. 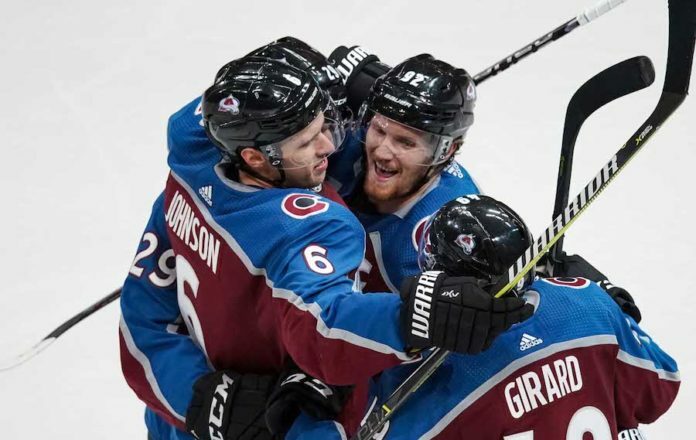 So now, moving forward, the Avalanche has one of the game’s superstars, and it’s hard to imagine the MacKinnon-centered line, with Mikko Rantanen and captain Gabe Landeskog on the wings, doing anything but remaining productive. The other thing the NHL Awards ceremony made clear, with Jared Bednar a finalist for the Jack Adams Award, is that the Avs have solid coaching – something that wasn’t necessarily apparent during Bednar’s rough initial season behind the bench after taking over for the ripcord-pulling Patrick Roy in August 2016. 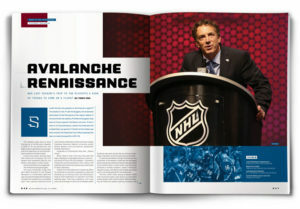 But Sakic also realized his reputation was at stake after selecting a first-time NHL coach to succeed Roy, who had come to believe he didn’t have enough in player personnel decisions. Sakic stuck with Bednar and was rewarded. So was Bednar, who signed a one-year extension that leaves him under contract for two more seasons. The reboot is working. That was far from a given when the 2016-17 Avalanche, up against the cap and posting only 48 points, arguably was the worst bang-for-the-buck team in NHL history. Josh Kroenke and the KSE hierarchy looked into bringing in a de facto head of the hockey operation and massaging titles, or essentially kicking Sakic upstairs, but stuck with the Hall of Famer whose number is hanging from the Pepsi Center rafters. This was somewhat underplayed, but the Avalanche also showed that Sakic knows what he’s doing, that the regression since the magical 112-point season in Roy’s first year wasn’t necessarily going to define Sakic as an executive. The mayor’s office shouldn’t be planning on a Stanley Cup parade anytime soon. But with the Avalanche among the league’s youngest teams last season – the exact ranking fluctuated – and likely to stay as young or get younger, the future is bright. The major issue is whether veteran goaltender Semyon Varlamov, entering the final season of his contract, can stay healthy. Some would disagree with this, but the Russian has shown he still can be among the NHL’s elite in the net if he can stay in the crease. 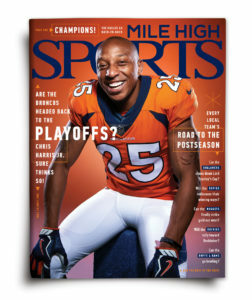 But because of his groin muscle issues and, well, bad luck, he still is a question mark. Ultimately, Varlamov was through for the season (and postseason) when suffering a knee injury late in his shutout of the Blackhawks on March 30, and while Jonathan Bernier had his moments when called up to be the temporary No. 1 at various stages of the season, it eventually became clear that if Varlamov can’t be counted on, the Avalanche needed to upgrade behind him. The Avalanche needs to develop scoring depth. Relying so much on that top line won’t cut it moving forward, and there’s probably no way Colorado can get as much contribution from the Carl Soderberg-centered third line again. And on defense, the issue is whether the Avalanche can get away with having both Tyson Barrie and Girard in the top six as undersized blueliners. As tantalizing and even electric as Girard was at times, there still were the moments he got turned inside out in the Colorado zone. And Barrie always is going to be Barrie. Expecting him to become more of a physical force is unrealistic. The good news with Erik Johnson is that as he neared 30, he was among the top defensemen in the league, clearly – and finally – the Avalanche’s cornerstone. But again, he was knocked out of the lineup by injury, this time a fractured kneecap, and wasn’t available for the playoffs. In fact, we probably didn’t make a big enough deal of that. The Avalanche was minus its top goalie and its top defenseman down the stretch and then in the series against the Predators. Think of Nashville minus Pekka Rinne and P.K. Subban. That wasn’t an excuse, but at least an issue. The Avalanche doesn’t play in a vacuum, but in the Central Division. 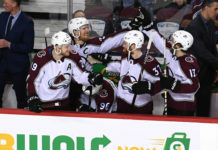 It’s possible that as other teams in the conference – say, St. Louis, Dallas and Chicago, which all missed the playoffs – attempt to rebound, it will be even harder for the Avalanche to finish in the top eight and make the postseason. But this team will be at least as good as last season … and probably better. The Top Line – A dynamite center, Nathan MacKinnon, and a productive top line, with MacKinnon centering Mikko Rantanen and Gabe Landeskog. MacKinnon now is more than a guy who does Tim Hortons commercials back home in Nova Scotia with Sidney Crosby in the offseason. He’s a true star himself. An anchor defenseman in Erik Johnson – If only he can stay healthy. He joked about drinking more milk in the offseason, but it’s going to take more than that. At some point, it’s not that you’re injury prone as much as, well, you just get hurt. The definition is splitting hairs. Youth, youth and more youth – This again will be one of the youngest teams in the league. Even those who have hit 21 better have their IDs handy, because they don’t look it. Elite Goaltending – And that likely will require Varlamov to keep off the injured list. If he stays in the crease and flashes back to the form if 2013-14, when he was a Vezina Trophy finalist, the Avalanche has a much better shot of getting back into the postseason and making a deeper run. Scoring depth up front – It can’t all be MacKinnon, Landeskog and Rantanen. Others must step up, including Tyson Jost, Alexander Kerfoot, J.T. Compher and perhaps Sven Andrighetto. More physical play – Especially on the blue line to augment Johnson. Nikta Zadorov made eye-popping hits and tantalized with his on-again, off-again development. He could be a star waiting to happen. The Avalanche won the market back last season. This is a far cry from the glory days of the franchise, but with Sakic in charge, the renaissance was noticeable and heartening.